Why Are There Volcanoes Where They Shouldn’t Be? Easy Answer: Mantle Plumes….But here is the long winded answer served up by this latest find: Madagascar, the big island off the east coast of Africa with the lemurs and baobabs, is thought to be sitting in the middle of an old tectonic plate, and so, by the rules of plate tectonics, should be tectonically quiet: few earthquakes and no volcanoes. But it’s not. The island has been away from tectonic action for the past 80 million years, said Martin Pratt, research scientist in earth and planetary sciences at Washington University in St. Louis, yet it experiences about 500 earthquakes per year. Since this part of the world is geologically complex, there are lots of interesting possible explanations for the volcanoes. To figure it out, the geologists needed to be able to examine not just the island’s accessible surface, but also what lies beneath the rigid crust and upper mantle. To image Earth’s interior, geologists use a technique called seismic tomography that is similar to the medical CT scan, probing the earth’s stricture with seismic waves from distant earthquakes and ambient noise. But remote and politically unstable Madagascar was largely unexplored by seismic methods until recently. Starting in 2010, however, three groups, including one led by Washington University seismologists Wysession and Doug Wiens, began to deploy seismic arrays on Madagascar, on nearby islands in the Mozambique channel (between the island and Africa), and on the ocean floor east of Madagascar. In an article published online Nov. 22 in Earth and Planetary Science Letters, the Washington University scientists report that they found three areas of hot rock within the mantle beneath three separate volcanic provinces on the island. They also see signs that the bottom of the lithosphere beneath the central volcanic province has peeled off. As the cold rock sank into the mantle, hotter rock flowed around it to the center and the south of the island. The crust, unburdened, bobbed higher. The northern volcanic province, meanwhile, probably taps a different heat source. 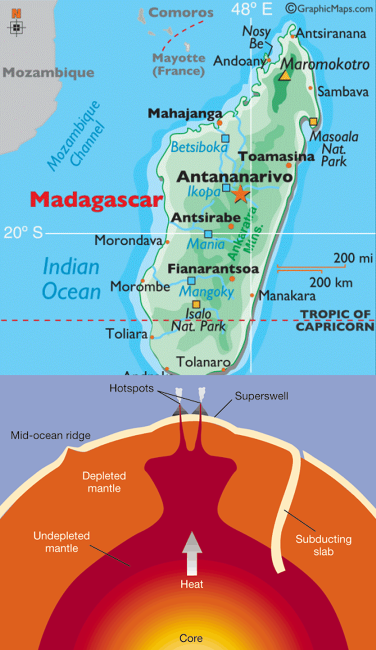 Madagascar, originally part of the ancient continent Gondwana, was formed in two steps. The island, together with India, pulled away from Africa 150 million years ago, stretching and thinning the crust on the island’s west coast before it finally snapped off. The thinned crust on the west coast sagged and the dips filled with sediments, forming deep basins of sedimentary rocks. Then, about 90 million years ago, when the mini-continent migrated over the Marion hotspot (a mantle plume that now lies beneath the Antarctic plate to the south), brief but voluminous eruptions covered the island in lava. The blast of heat is thought to have cracked the overriding continent into two parts, Madagascar and India, which scraped past the east coast of Madagascar on its way north toward Asia, leaving a very straight coastline there. But the volcanism in the central, northern, and southern provinces are much younger than the basaltic remains of the 90-million-year-old eruption still found around the perimeter of Madagascar. So the question was: Where did they come from? Lead-author Pratt used three complementary methods to analyze surface waves (seismic waves trapped near Earth’s surface), which are created by distant earthquakes and from sources of seismic noise, such as ocean storms. The images show three low-velocity seismic anomalies corresponding to the upwelling of hotter mantle rock along the island’s backbone. The cause of the three hot regions in the mantle is a mystery, however. Though there is some indication from the tomographic images that the regions might be connected, particularly the southern two, further modeling of deeper structure will be needed to confirm. One origin of the hot regions previously has been proposed to be hot rock rising through the mantle as the Comores hot spot, which has created a set of volcanic islands just west of the north end of the island. The authors have a different idea, however, and it comes from the way that the central and southwestern provinces appear to be connected at depth. “If you look at the images that Martin has made,” Wysession said, “you can see a horseshoe shape where the central hot mantle anomaly swings west and then comes back east again, connecting the central and southern provinces. But what caused the bottom of the lithosphere to peel off? “We think it may have been the Marion hotspot,” Wysession said. “The underside of the plate was heated by this huge blow torch 95 million years ago, weakening the rock enough that it was able to peel off. So we’re still seeing collateral damage from this ancient event.” This idea also has the advantage of explaining the unusually high elevations of the northern half of the island. Once the heavy bottom of the plate fell off, it stopped pulling down the crust, which rebounded upward as much as a kilometer as hot rock from below took the place of the delaminated slab. Something similar happened underneath the Great Basin of the western United States, he said, where the bottom of the lithosphere also split off, forming a large blob of cold material sinking down through the mantle below the surface of central Nevada. There, the blow torch that delaminated the plate was an ocean spreading center that was overridden by the North American plate, Wysession said.